The Internet has become an integral part of children's lives, enabling them to undertake research for school projects, talk to their friends and access information from around the world. 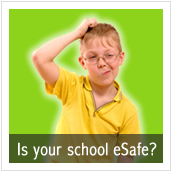 Increasing provision of the Internet in and out of school brings with it the need to ensure that learners are safe. Unfortunately though, there are times when Internet use can have a negative impact on children. Schools should be aware of the potential dangers by taking measures to ensure safe usage by all.